Making healthier lifestyle choices is not easy, trust me I love my home comforts and sweet treats! Sometimes it's just about making small changes and you'll soon be reaping the benefits. I hate feeling groggy and generally unfit, so if I don't make changes now then I know I never will. Here's 10 healthy habits I'm following - I would love to know any you guys are doing! 1. A cup of warm water and lemon when I wake up - great at aiding digestion and getting rid of toxins. 2. Work out at least twice a week for 45 minutes - I currently do pilates, what do you guys enjoy doing? 3. Have a vegetarian meal once a week - trying to cut back on red meat. 4. Drink less alcohol - a tricky one but I haven't had a drop since the new year! 5. Avoid eating too late - allows your body to digest food and not over indulge. 6. 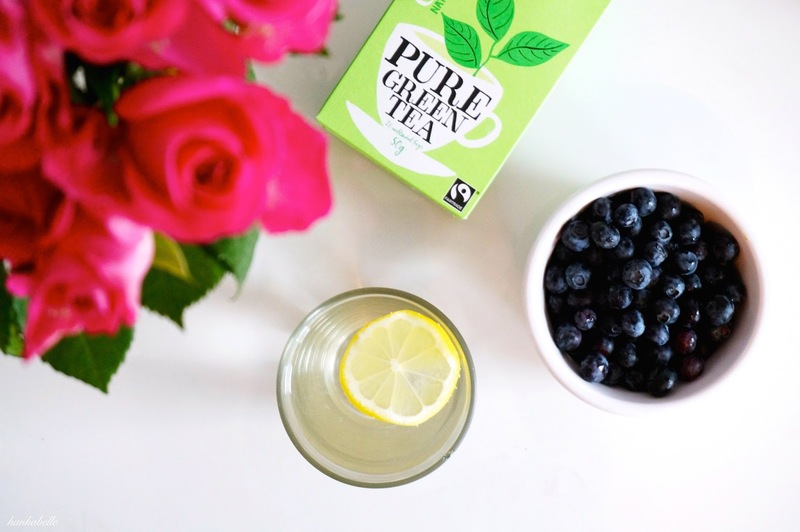 Switching caffeine for herbal teas- green tea is packed full of antioxidants. 7. Eye test - always good to check you're on the right prescription to avoid headaches and eye strain, I've found out my eyes have got better when I got them last checked! 8. Take a multivitamin daily - great for when I don't get all of my 5 a day. 9. Take my lunch break outside - daily dose of vitamin D and good to stretch my legs! 10. Visit the dentist every year - I put a reminder in my phone so I don't forget. What healthy habits have you kept up this year? Love your suggestions! Definitely behind on the opticians and dentist front (but that means I can't see how unhealthy my teeth no doubt are... every cloud...) so I'm feeling very inspired to get on that. I try to drink more water on a daily basis and also start my day with lemon water too in order to try and start with a nice cleanse. Cutting down on alcohol has really made a difference to my skin and I think the next step is to cut down on tea and coffee as I feel that I drink a little bit too much! These are great tips, I follow quite a few of them too! I love pilates at the moment, and I'm desperate to spend more time outside once the weather's warmer! I try to drink lots of water, It is so hard though when you think You're supposed to have 2 L a day. I don't really drink anyway, but I do feel better after not eating meat as well! Sounds good! Yes I can't wait for the weather to get warmer! I know it's tricky but when I don't drink enough I get headaches, so I much sure I keep hydrated! I agree, cutting down on eating meat feels good! Mine is cutting out social media an hour before bedtime.... to help me unwind and relax away from the buzz that is insta/twitter/fb! It's so difficult! Just discovered (and followed!) your gorgeous blog! Love these tips, will definitely be trying out a few for myself. I'm terrible with the dentist. I'm not scared of it or anything like that, but I always fail to go regularly and only remember when something hurts... oopsie. I'm trying to drink more tea and less coffee. It's hard for me (VERY hard), but I'm trying hard. Let's see how it goes! I've drunk lemon water every morning for years now, the best way to start your day and feel a little fresher (i.e to wake up your face when inside you feel like you're dying) ;) Trying to avoid caffeine and eating too late, but coffee and midnight chocolate/crisp binges are my vice! That's such a good tip Lucy! I know it's super hard, tbh when I get home from work I don't look at my phone. My problem is watching youtube in bed haha. Thanks Katy, I know it's one of those things I tend to forget! Oh gawd tooth aches are the worse, I always go in hope in prevent any unexpected pain! Yes caffeine is so addictive, I used to drink so much coffee and then I was allergic - a blessing in disguise. You can do it! That's great Elle, I know when I'm hungover that lemon water always me feel cleanse, haha. It's so hard to avoid eating too late, if I do I try and make sure I wait a few hours before I go to bed! Great tips! I love number 3, I'm not the type to push my veggie ways on everyone but avoiding red meat makes a huge difference. I'm so guilty of number 5 though! Thanks Jess, yes there's so many health benefits on cutting back on red meats! I'm trying to do it more often. That's great Siham! Caffeine is a tough one to give up....it was only when I got allergic to coffee then I gave up but I still drink green tea. Great tips girl! I have a horrible habit of snacking late and a serious coffee addiction, both which I'd love to tame this year. These are great! I start every morning with warm lemon water, too! (Followed by a cup of green tea after breakfast.) I sleep with my window slightly opened at night for fresh air, but since it's winter and some nights it gets a bit too chilly, I sometimes wake up with a runny nose, but drinking my lemon water makes it go away right away! I only recently had this happen a couple times so I'm excited to share the very obvious and fast-working results, hah! I also do coconut oil pulling every morning (it really works!) and I'm on day 15 of a 30 day yoga challenge and absolutely loving it! I know it's so hard to stop snacking late.....i always think ill just have a few crisps haha! Great post & tips. I like the idea of small changes & swaps you can make to improve your wellbeing. I too always have hot water & lemon every morning, very cleansing! I also do oil pulling every morning (followed by the hot water & lemon), am addicted to it, another cleansing ritual & it has strengthened my teeth & improved my gums & i do feel it removes toxins! I like to air my bedroom every morning too & go out to get fresh air, love feeling fresh lol. I eat porridge every morning & never snack before lunch now because porridge is so wholesome & filling, especially as I top it with this https://www.ocado.com/webshop/product/Linwoods-Milled-Flaxseed-Sunflower-Pumpkin-Sesame-Seeds--Goji-Berries/222103011?from=search&tags=%7C20000&param=linwood&parentContainer=SEARCHlinwood & i add fruit too. Then I have a vegetable juice, I can't drink just fruit juice anymore - too sweet. I should try to avoid eating dinner too late though! That's so good you've kept up with the oil pulling, don't you just love that clean mouth feeling! Yes fresh air is a must, I always like to open the windows at work but people get cold, haha. Those seeds look really good, I like how it's a mix of everything you must feel so nice and full after eating that. Fruit juices aren't that good for you (I keep telling Hang!) I just stick to water!